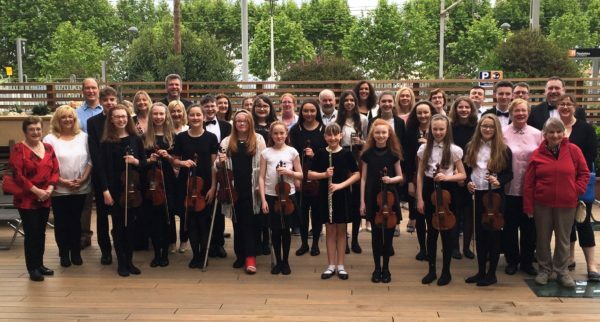 The County Tipperary Ryan Youth Orchestra was granted great honours recently as they attended the world renowned Costa Barcelona Music Festival 2018. They were welcomed to Calella, Spain by Montserrat Candini I Puig, Mayor of the City of Calella and were asked to lead the Music Festival Parade through the picturesque streets of Calella Spain with great cheers, dressed up in their usual Orchestral black and white adorned with their Irish and Tipperary colours, flags, bunting, and hats singing proud renditions of Ireland’s Call and It’s a long way to Tipperary! Following this, they got to open two concerts and performed their thirty minute orchestral performance which included a selection of traditional Irish pieces. The County Tipperary Ryan Youth Orchestra, conducted by Michael John Ryan, representing County Tipperary and Ireland, were among fifteen groups from eleven countries to perform at the festival. The County Tipperary Ryan Youth Orchestra’s Director was awarded a Diploma in Orchestral Arts by Festival Director, Mr Peter Laskowski. As part of this Costa Barcelona Music Festival Tour, Orchestra members and their families had guided visits of the breath-taking Montserrat mountains which houses the sacred Black Mandonna in the Benedictine Abbey Santa Maria de Montserrat, and had an outing to Barcelona. Great memories were made during this Music Festival – national flags and contacts were exchanged and don’t be surprised if you see holiday makers from South Korea coming a long way to Tipperary soon! Special thanks to Tipperary County Council for the Arts Act Grant funding which paid for transport to and from the airports.